Smartphones are now central to the lives of most UK residents. More consumers are buying via mobile, interacting with outdoor ads via smartphones, asking digital assistants such as Siri for advice, and receiving location-based ads or personalized mails on their handheld devices. 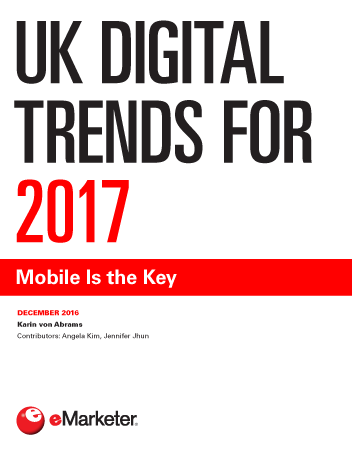 In 2017, more than 80% of UK internet users will have a smartphone. Moreover, the time adults spend with mobile devices will continue to surpass time spent with desktop or laptop PCs. Nearly 86% of UK digital shoppers already shop via mobile, and retail mcommerce sales will total £31.42 billion ($48.02 billion) in 2017, eMarketer estimates. Location-based marketing to mobile devices is on the rise. More than 72% of UK agencies and marketers polled in April 2016 said they already used location-based mobile marketing, and a further 21.3% planned to do so. The UK’s advertisers, publishers and service providers are also getting to grips with personalization. Individuals expect firms they deal with to communicate with them via tailored messages, and smartphones are well suited to this. Voice assistants such as Siri and Cortana have already brought artificial intelligence (AI) into the hands of many UK residents. As AI becomes more sophisticated and pervasive, mobile will remain a leading delivery channel. Digital technology massively expands the potential of out-of-home (OOH) advertising. And mobile devices are the ideal tool for direct response to ads in public places. One 2016 study found that OOH ads prompted a 17% increase in smartphone activity related to brands. "Nearly 73% of UK agencies and marketers polled in April 2016 said they used location-based mobile marketing of some kind, and more than 21% planned to do so."